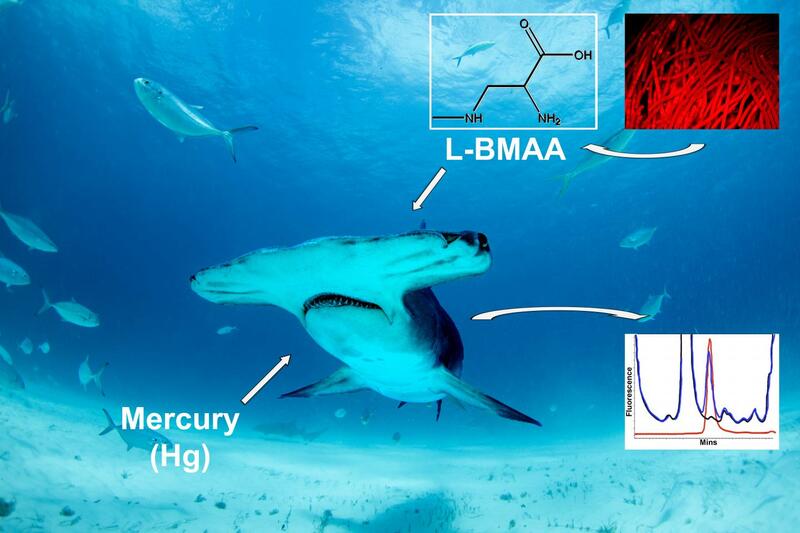 Fins and muscle tissue samples were collected from 10 shark species found in the Atlantic and Pacific Oceans for concentrations of two toxins--mercury and β-N-methylamino-L-alanine (BMAA). "Recent studies have linked BMAA to neurodegenerative diseases such as Alzheimer's disease and amyotrophic lateral sclerosis (ALS)," said Deborah Mash, Professor of Neurology and senior author of the study. "Since sharks are predators, living higher up in the food web, their tissues tend to accumulate and concentrate toxins, which may not only pose a threat to shark health, but also put human consumers of shark parts at a health risk," said the study's lead author Neil Hammerschlag, a research assistant professor at the UM Rosenstiel School and UM Abess Center for Ecosystem Science and Policy. About 16 percent of the world's shark species are threatened with extinction. The shark species sampled in this study range in threat status from least concern (bonnethead shark) to endangered (great hammerhead) by the International Union for Conservation of Nature (IUCN). "Our results suggest that humans who consume shark parts may be at a risk for developing neurological diseases." said Mash. "People should be aware and consider restricting consumption of shark parts. Limiting the consumption of shark parts will have positive health benefits for consumers and positive conservation outcomes for sharks, many of which are threatened with extinction due in part to the growing high demand for shark fin soup and, to a lesser extent, for shark meat and cartilage products." said Hammerschlag. Page took 0.017277 seconds to load.